What Did Xi Jinping Have to Say on Cyber Issues in His Big Seattle Speech? Most of Xi’s speech was familiar to China watchers, but there were some interesting notes on the cyber front. On Tuesday, Chinese President Xi Jinping arrived in Seattle for the first leg of his highly anticipated state visit to the United States. He wasted no time jumping into a packed agenda – after arriving at Paine Field in nearby Everett, Washington, Xi held meetings with local Seattle and Washington officials, attended the U.S.-China Governors’ Forum in Seattle, and then headed to a welcoming banquet in his honor. It was the banquet that attracted the most attention, as Xi gave his first (and only) major policy speech of his U.S. trip. The speech was everything we’ve come to expect from a Xi oration: grand pronouncements mixed with personal touches. Xi waxed poetic about his time in an impoverished village as a “sent-down youth” during China’s Cultural Revolution. He even found time to crack a few jokes, referencing the U.S. television show “House of Cards” and chuckling as the audience applauded a story about Ernest Hemingway inspiring the Chinese leader to order a mojito in Cuba. But from a policy standpoint, there was little new substance to Xi’s speech. It contained all the typical beats – references to the usual slogans (the “Chinese dream,” China’s peaceful rise, and “new type major country relations”); promises that China’s economic reforms will continue even as growth remains in the “medium-high” range; reassurances that China does not seek to overturn the current world order and is not scheming to extend its political influence at the expense of the United States. The speech was well-delivered and carefully crafted, but the messaging itself was familiar. To me, the most interesting part was the section on cyber issues. That topic is newer to Chinese top-level political discourse, so the message here is more interesting – particularly as Xi’s phrases here may become a new cyber mantra. Beijing has moved beyond the simple statement that “China is also a victim of hackers” (though that refrain also appeared in Xi’s speech), toward a fuller discussion of China’s stance on cybersecurity. Xi spent a fair amount of time addressing cyber issues, though much of it largely repeated what he had previously told the Wall Street Journal in an exclusive interview. “The Chinese government will not, in whatever form, engage in commercial theft or encourage or support such attempts by anyone,” he pledged in his speech. Xi also said that hacking against commercial targets and government networks are both crimes and should be “punished in accordance with the law” – a position that won’t be popular with the Obama administration, which has tried to argue that government bodies are legitimate targets for cyber espionage in the name of national security. Xi’s statement here is a rejection of the White House’s position that a dividing line can be drawn between cyber economic espionage and cyber espionage on foreign governments. That serves as a reminder of an important point: the United States is not the only country trying to get its idea of cyber norms approved by the international community. China is also actively trying to shape cyber discourse to ensure that, should a “code of conduct” for cyberspace be agreed upon, it will reflect China’s own best interests. Part of that involves Beijing trying to eliminate support for the divide the Obama administration prefers between economic and security targets. Chinese officials have also been heavily pushing their idea of “internet sovereignty,” which would allow each nation to govern its own section of cyberspace according to its own domestic laws. Even while the bilateral cyber spat between the U.S. and China continues to play out, this larger tug-of-war over cyber standards at the international level is worth paying attention to. There was a grain of hope on the cyber front, however. Xi said that “China is ready to set up a high-level joint dialogue mechanism with the United States on fighting cyber crime” – signaling a possible return to joint cyber talks after China cut off the existing dialogue in 2014. China walked out of the bilateral Cybersecurity Working Group in protest after the U.S. Department of Justice indicted five PLA officers on charges of cyber economic espionage. It’s progress with a caveat. Dialogue will be crucial to seeing sustained progress on cyber issues, but merely restarting the shuttered talks inevitably has a feel of “back to square one.” To avoid that perception, the two sides should take care to make this dialogue different from the working group; the promise of a “high-level” mechanism could be a signal in that direction. James A. Lewis of the Center for Strategic and International Studies has more on what to look for in a new U.S.-China cyber dialogue. 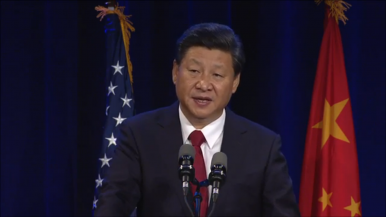 Xi Jinping ended his speech with a prescription for improving the U.S.-China relationship. “There is no such thing as the so-called Thucydides trap in the world,” Xi said. “But should major countries time and again make the mistakes of strategic miscalculation, they might create such traps for themselves.” To avoid this trap, he explained, the U.S. and China must correctly understand each other’s strategic intentions. Cyberspace is one of the many areas (see also: the South China Sea) where the potential for misreading strategic intentions is great, and the costs are high. Even worse, however, is the possibility that both sides are reading the other’s strategic intentions correctly – and that a slow-burning confrontation on the cyber front is the new normal. Helping you make sense of the barrage of media coverage on Xi and China: this week's China links.